On January 19, School-Business Partnerships of Long Island, Inc. (SBPLI) and New York City FIRST (For Inspiration and Recognition of Science and Technology) presented theFIRST Tech Challenge Qualifying Tournament at Hewlett High School. The challenge was "FTC ® BLOCK PARTY!SM", in which Alliances of two teams programmed their robots to place plastic blocks onto pendulum goals. 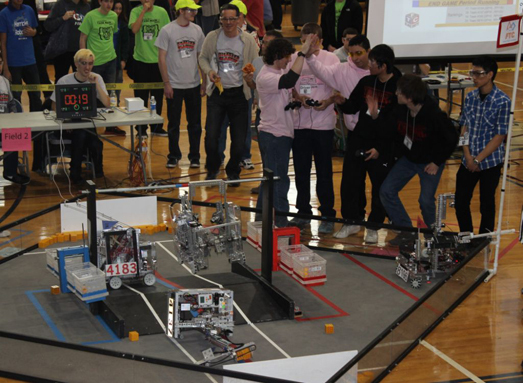 During the two-and-a-half-minute match, both Alliances also had to raise their team flag up a flagpole, elevate their robots off the ground using a platform pull-up bar, and finish the match with a balanced pendulum to earn extra points. * Indicates that these teams will move onto the NYC/Long Island Regional Championship Event at NYC/Polytechnic Institute on March 8. ++ Horace Mann was captain of the Alliance Finalist and will compete in the NYC/Long Island Regional Championship. Sponsors included Hewlett-Woodmere Public Schools, Rockwell Collins, FTC CAD and Collaboration, PTC, Merrill Lynch, Bloomberg, Con Edison, and Goldman Sachs and Friends.